Although local radio had existed in other countries for very many years, it had never been tried in Britain. In the 1960s the BBC carried out a number of experiments and tried to encourage the government to let it open a number of local stations. Later in the decade the government asked the BBC to open 9 experimental stations. The BBC had to provide the capital costs but towns and cities involved had to provide much of the running costs. I was born in Hove and except for a period doing National Service I had lived in the twin towns all of my life. I had joined the BBC in the war years as an engineering Youth in Training. By the 60’s I had become a radio producer and presenter based in London’s Broadcasting House. Local radio looked an interesting challenge so I took part in some of the experiments. When Brighton indicated it wanted a station I applied for the post of station manager and was successful. The BBC chose the old Blenheim Hotel on the corner of the Marlborough Place, opposite the north gate of the Royal Pavilion as the site for the station. Latterly it had been the local office of an insurance company. From the outset I believed that the development work for the station should not be done in a London office so my secretary, Carol Head and I set up an office in a small bedroom in her house in Hove! One of the first tasks was to find staff for the station. One of the most important people to be appointed was the station engineer, Ted Castle. He was a London outside broadcast engineer responsible for events like the Boat Race – and was the designer of the newly introduced radio car. Working with Appointments Department we went on to select my deputy, the Programme Organiser. This was David Waine, a television reporter from Southampton who was still in his early 20s. Some regarded this as a somewhat controversial decision, feeling that I should have selected someone older and more experienced. David proved a wonderful person to work with and later moved on to open a local station in Bristol, then to Plymouth to run their television and radio output and finally to Birmingham to take charge of all the BBC’s activities in the Midlands. No journalists were appointed initially, as the decision was taken to get the local news from an agency – the one selected was that run by Alan Robson. To be responsible for the programmes five producers were appointed. The one local man, who incidentally had no experience of radio, was Keith Slade. He became what was probably the best arts producer in BBC local radio. John Henty, who came from Croydon and did have some radio experience, was appointed to look after sport. In later years he became very popular with the local audience doing more general programmes. Hilda Bamber. with experience in Services Radio, joined us to make programmes for women. Mike Matthews had worked for 5 years for the NZBC (New Zealand Broadcasting Corporation) as a presenter and documentary maker; he had a talent for presenting music programmes. Chris Jones was, if I remember correctly, a member of BBC television staff; his subject locally was education. To work with the producers there were four station assistants. There was Gill Montagu and Jeanette Pointon [who was a London secretary]. Carole Stone had been a typist in the Southampton newsroom. She moved on to become a local producer in Bristol and then became the producer of the national political discussion programme on radio, ‘Any Questions’. On retirement from the BBC, she used her experience with the programme to become a top London hostess and PR executive. Finally, another vital appointment was the second engineer, George Orchard, who like Ted became a tower of strength to the station team. As the studios and the wiring was going into the station I asked if we could now have an office. Once it was agreed we ran into another problem because the furniture arrived on a Sunday and we had no key to the building. It was only solved by my son getting in through a window and then opening the door. The office was on the third floor and eventually we had one telephone line. I remember the station being Radio Sussex in the 80s. I was 10 and managed to get a Sunday joke slot on Roland Myers’ show. I was terrible! Thanks Bob for your article. I remember that the radio station was very unique in the use of the 24 hour clock when doing timechecks on air, e.g “here is the news at 17 hours”. There were some fine presenters on The Coastal Sound. I remember in particular the wonderful tones of Piers Bishop on the breakfast programme Coastwise. Des Lynam, of course, started his illustrious career in broadcasting by doing reports about the Seagulls on the station. Hi Bob: Just read this article as I was looking for local radio Brighton/Sussex celebs for a project on public speaking. I worked with Ken Blakeson on the Saturday Children’s club Cabbages and Kings and in 1982 I became part of the sports team and later ended up fronting a programme called Holiday Roundabout where I was a roving reporter on the local attractions. I would be interested in speaking to you if you have time. Funny how these things crop up. I was just talking to someone recently about the show Cabbages and Kings at BBC Radio Brighton. As a young boy I was invited to participate in these shows in the late ’60s (I think). I had been the lead at a play in the Dome and was with Brighton Amateur Dramatic Society and somehow that led to the invite. I remember coming in to the building on the corner on Saturday morning full of excitement about taking part in Radio Broadcasts. A fond memory to this day. The time has come, the Walrus said, to talk of many things … I too remember Cabbages and Kings and, if memory serves me right (maybe someone will tell me if it does), it was also connected to Brighton Children’s Library when John Cunliffe was the librarian. He encouraged youngsters to assist in the library and also ran evening sessions where he would tell stories. I can remember it now (including one evening when, on the way home, a friend and I were crossing Elm Grove at The Junction and he nearly got knocked down!). Pioneering days indeed – with a keen emphasis on programmes made for the community, by the community. I recall everything from a Scout Master to a sailing enthusiast researching and presenting their specialist shows, with expert guidance from BBC producers. And, a six-foot trail of quarter-inch magnetic audio tape threaded across the room in order to create a time delay so that the news from London could be put on air with a local introduction at one o’clock (sorry, thirteen hours!). Knew Hilda Bamber when I was hanging at the Chelsea Potter many years ago. Hope that she is well. Can anyone tell me what happened to John Henty? Didn’t he do some programmes on Radio 2 at one time? He was a very good presenter with a unique style. I think I knew Hilda Bamber many years ago, when we were both teenagers in Wigan. At least, I knew someone with that name, who I think was in journalism. My name at that time was June Seakman. I would love to hear from her if indeed she is the person I knew all those years ago. Radio Brighton was light years head of other local stations in technology and innovatrion – I worked there – and later at Capital FM and LBC/IRN. My father presented a gardening programme on Radio Sussex for several years until his death in 1976. I wondered if anybody remembers this? I knew a Hilda Bamber who worked in radio in New Zealand in the 1960s; is that the same person? I’ve just acquired some vinyl 7″ singles from BBC Radio Brighton, from the late 60s/early 70s. They are still in library sleeves. They certainly kept their singles in good condition. 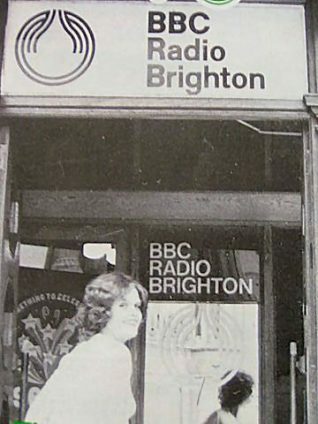 I started my working life with a happy year as a freelance reporter at Radio Brighton in 1976-77. I still have a permit signed by Ted Castle allowing me to drive the radio car for outside broadcasts, a treasured souvenir, but sadly no longer valid. I remember taking the car out once in a futile pursuit of something big which had escaped from the Brighton abattoir. Like Trevor Butler (above) I remember the astonishing Heath Robinson contraption for delaying the national news bulletins from London during the local introduction: the quarter-inch tape ran up a tower, round some pulleys and down another tower into the machine which was to play it; the height of the towers and the distance of the pulleys from the floor determined the minimum and maximum duration of the local introduction. It was thrilling stuff each time it was used, waiting to see if an accident of timing would cause pulleys to hit the floor and the chaos which would ensue. I am very sorry to hear that Bob Gunnell passed away on Saturday 19th April 2014 at the age of 89. He will be remembered as one of the early innovators of BBC Local Radio. He will be remembered by all those broadcasters who worked at Marlborough Place. Thanks Paul for letting us know about the sad news of the death of Bob Gunnell. I had the pleasure of being interviewed by him several years ago for his community radio show. He and his colleague Richard Davis were highly professional – but really good fun. His early work on BBC Local Radio should not be forgotten – he was a true innovator. I worked at BBC Radio Sussex for 9 years between ’85 and ’93. Started on the youth Sunday night show Turn It Up before gaining experience and moving onto some of the daytime shows. Great days all in all. Couldn’t stomach all that Sussex/Surrey nonsense that went on in the early ’90s and so left to pursue other interests. Many years ago I knew a Hilda Blears who married a Keith Bamber right after WW II. Could it be the same Hilda Bamber? I worked on Cabbages and Kings in the early seventies; we took over the downstairs producers office. The kids reviewed toys and books that were sent in that had previously gone to staff. Patrick Moore was a regular visitor and an eighteen year old up-and-coming athlete called Steve Ovett who went to Varndean. I took Steve to an orienteering competition on the Downs where he was beaten by an eleven year old; one of them could map read. Interviews were done on the course with a Uher. Wonder if that kid ever realised he beat an Olympic champion? In the summers of ’73 and ’74 there was a series called Summersearch which gave kids interesting ideas for their summer break from school. Chris Warbis, the producer, was very innovative. I worked for him on various things including rock band interviews; the going rate for an interview edited to broadcast lasting 2 and a half to 3 minutes was £3. Each interview involved a separate contract. Election specials involved all night stints. Julian Amery was safe in Pavilion with 26,000 plus majority but Kemptown went to a recount once. I worked on SummerSearch. The theme tune was Mungo Jerry “In the Summertime”. I always think of the programme whenever I hear that song and I am transported back to the mid ’70s. One of the strangest things I did was to interview Eartha Kitt. She kept slithering off a chaise longue and made it almost impossible to keep a microphone near her mouth in order to get a useful interview … well she hardly said anything, mostly just purred. I don’t think we ever used that interview.